Police and corrections officers take an oath to serve and protect. You'd expect when they're injured on duty, they're taken care of. But we uncovered a heartbreaking story about a system that many say is letting our officers down. A corrections officer and his family are living a nightmare. After an unfortunate accident caused a spinal cord injury, he feels like he was thrown away when he just wanted to heal and go back to work. That's because instead of helping, he says workers' compensation is copping out. "The pain is always constant. It just seems to be getting worse." Robert Stilz spends most of his time managing pain and doing what he can to keep his body moving. "It's starting to get more difficult. Maybe 2 or 3 days a week where I can't actually do anything." His wife, Vicki, feels helpless and heartbroken. "Our family is not the same anymore. My husband is not the same person. In some ways, I've lost my husband. He's not able to do things he was able to do before." Before Robert was an energetic outdoorsman who loved travel, was in great physical shape and was an involved and active father of four. "I always enjoyed life," says Robert. "Spend time with the kids. Doing sports with them." He spent four years in the Air Force serving our country before moving on to a career in healthcare accounting. At age 42, he changed course, becoming a corrections officer at the Clark County Detention Center in 2008. "I thought I could make a difference," he says. But that chapter was cut short on April 10, 2013, when Robert pulled a heavy cart full of inmate meals off an elevator. "You kind of had to turn, and when I was turning one of the wheels locked up or broke, and I felt the pain in the shoulder and the neck." He added, "About 3 days afterwards I took a shower. When I got out of bed the electricity hit my body... and my body completely hit the ground." Robert filed for workers' compensation. He went to urgent care where the doctor told him to get an MRI stat. But workers' comp declined his claim for 30 days. And sure if enough, when he finally got one it shows multiple discs in his neck damaged, at least two pinching his spinal cord. "He could barely walk without help," says Vicki. "His hands, he couldn't use them. Had to help him with every physical need." Vicki talked to a lawyer and soon learned what many say are dark secrets about the workers' comp system. "They have you hostage, those were his words, you are held hostage in this state. The law says they have 30 days to decide whether it's really workers' comp or not." A workers' comp doctor confirmed his "symptoms are a direct result of the incident he described as occurring" on the job. Even so, workers' comp did not approve the MRI until months later and surgery until 82 days after his injury. "It created white matter damage," says Robert. "Doctors said that's going to be dead. I'm going to have nerve issues for the remainder of my life." After battling delays and outright denials, Robert's family wants to know how an insurance adjuster can override the ER doctor's immediate order for an MRI. But there's little he can do to hold them accountable because Nevada law 616D.030 states, "No cause of action may be brought or maintained against an insurer or a third-party administrator who violates any provision of this chapter." "This is all about money," says Randy Sutton, a former Las Vegas police lieutenant. "I wish I could tell you that what is happening in Robert's case is an isolated incident but it's not." After 24 years on the force, Randy suffered a heart attack while on patrol. 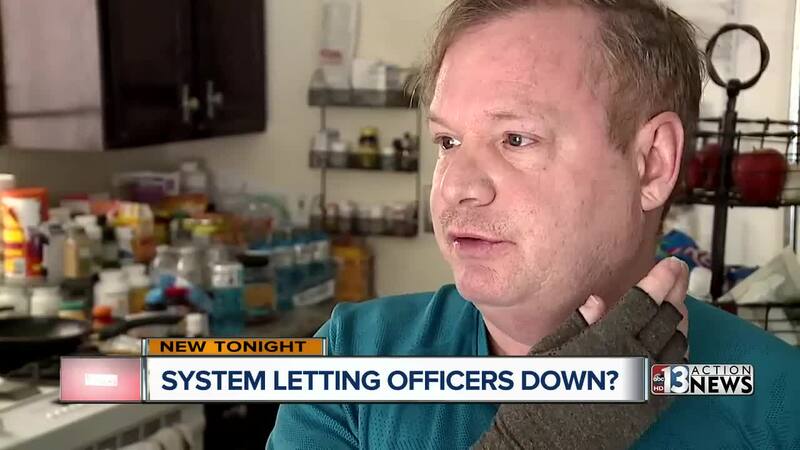 He says Las Vegas Metropolitan Police Department workers' comp delayed and denied his claims too and he's seen it happen to hundreds of officers. "The desperation in these law enforcement families is something that is so incredibly dramatic to see and so tragic is the only word I can use," he says. Robert's battle now is against complications typical of spinal injuries that will plague him for life. And Vicki says there's something else that's slowly killing her husband. "Sleeping is the biggest thing," says Robert. The pain so bad it cuts through, keeping Robert from getting much more than minutes of sleep at a time. "Best case scenario," Vicki says fighting back tears. "He has about seven years from the injury before his body just shuts down." As they stare down his fate, they still have to fight. The system they expected to help Robert remains their biggest adversary -- denying and delaying care, forcing them to file appeal after appeal, overwhelming them with paperwork. "I was spoiled fruit," says Robert. "I was no good. Discarded." Now knowing what could happen to someone you love in the blink of an eye, Vicki is fighting for change. "I want to make a difference with my husband's case because he only has limited time. And I want what happened to him to make a difference. I lost my husband. I want what happened to him to make a difference." Even though Robert is openly talking about his case, Las Vegas police say state law prevents them from talking to us about any workers' comp issues. We also reached out to CCMSI, the company LVMPD is contracted with for workers' comp, but they declined an on-camera interview. No answers there, but Randy Sutton is creating a new national organization called Wounded Blue to help injured officers.